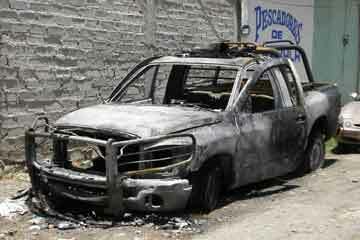 Chapala police chief Ramon del Arco scratched Unit 026 off his inventory of functioning patrol vehicles after a freak fire reduced the pickup truck to a useless heap of charred metal. The truck caught fire at around 10 p.m. on Saturday, May 24 while two officers were out on routine patrol along Chapala-Jocotepec highway. The policemen were driving in the vicinity of La Canacinta when the vehicle started to act up and smoke began pouring out of the motor compartment. They pulled over on the side of the road and descended the truck to assess the problem, only to watch as the whole front end suddenly burst into flames. The men ran across the road to a Pemex service station where they were able to borrow a fire extinguisher, but by then the fire was beyond control. Firefighters from Chapala, Jocotepec and Ixtlhuacan de los Membrillos rushed to scene, arriving to cordon off the area for safety, but too late to save the patrol from irreparable damage. Del Arco reports that the fire was caused by an unspecified mechanical failure. Sounds of successive explosions heard by west end Ajijic residents were attributed to blowouts of the motor and gas tank that occurred as the conflagration spread. According to the chief, the police force is now operating with 19 patrol trucks rated in fair to good mechanical condition, plus two 2014 models in top shape that were recently provided to the municipality on permanent loan from the state government.